When you have a conflict or dispute that you can’t resolve on your own, where do you go? You want to take your problem to a place where you can speak and be heard, a place where you can be assured that justice will be administered, a place where your problem can be solved once and for all. Most people think a courtroom is the best place to do this. However, you might be surprised to learn here that a mediator and a mediation conference can actually administer more justice than a judge or jury in court. What do you expect from Lady Justice? Did you ever stop to consider, what does it really mean to administer justice? Start by examining Lady Justice, the symbol for justice. She is blindfolded carrying a scale and a sword. What does this all mean? Let’s compare and contrast just how well our modern day judges, juries and mediators really work to resolve our modern day conflicts and disputes. Then you decide, who does it better. The blindfold represents impartiality or objectivity, two things that are sorely lacking when conflict and disputes occur, two things that a good mediator is trained and legally required to bring to the dispute resolution process. In fact, you might actually get more objectivity and impartiality from a mediator at mediation than a judge because, unlike a trial, the whole mediation process is confidential. No mediator, unlike a judge, need worry about public appearances, pressure or any other outside influences which could restrict or sway their impartiality or objectivity. Next is the scale or balance – the weighing of evidence. Good mediators are trained and very comfortable looking at the evidence and theories presented by both sides and will routinely challenge all parties to see how well their case might stand up to logic, common sense, or even some basic rules of admissibility or relevance. Mediators are allowed to examine and weigh a lot more things than a judge or jury can. In mediation, parties can place on the scale, any items that might be personally relevant to them to try to resolve a specific dispute. This often includes items which would never otherwise be allowed to be introduced or ever considered in court. Finally, there is the sword, or more specifically, the unsheathed sword, the symbol for power, punishment and enforcement. I would call this the “off with their heads” or swift justice component. When it comes to civil litigation, justice is anything but swift. Civil judgments are not a guarantee of either finality or performance. There is no debtors’ prison in the United States, and there is usually almost always a right of appeal. Mediation, on the other hand, if successful, usually ends with a legally enforceable consensual agreement which likely will contain specific new incentives and penalties within it to help insure performance and limit any rights of appeal which would otherwise remain unresolved and at risk within a judgment entered in court. So where is justice best served? Based on the preceding analysis, it would appear that mediators and mediation conferences may actually administer justice better than the court system. However, the most compelling reason to mediate instead of litigate is the fact that lawsuits rarely, if ever, administer any justice. The court system huffs and puffs along but almost always fall short of finishing the job. Imagine for a moment if courts were judged for quality and efficiency just like a factory. You file a lawsuit, you place it on the production line and then you watch and you wait as lawyers and judges argue and cajole to try to assemble a case and output a judgment. You might be very surprised to learn just how little is accomplished in court and just how much time and money is wasted in the process Read more. Imagine for a moment if courts were really held accountable to efficiently resolve disputes just like factories were responsible to produce goods. You file a lawsuit, place it on the court’s production line then and then watch lawyers and judges work to assemble a case, complete a trial and output a judgment to resolve your dispute. What you would find is that litigation is one of the most in-efficient processes left on earth. More than 95% of all cases are never finished in court. Courts rarely assemble any trials or produce any resolutions to any of the cases that enter their “factory.” Reporting from state and federal courts from across the United States show that courts only try and decide less than 5% of all cases filed. In other words, the overwhelming 95% majority of cases leave the court system without a finished product. Costs of production are not recoverable. Then let’s consider the cost people have been paying the legal system to try to resolve their disputes. It is estimated that the average cost of civil litigation in the United States (largely attorney fees) ranges between $43,000 and $122,000. People have to pay these legal fees and costs regardless of whether their cases are ever tried and decided in court. Its just the price you pay in the United States to try to resolve conflict and disputes in court. In most situations, legal fees are not recoverable in court. Read more. For every single case that is finished in court, more than 1MM is spent on cases that are never tried. Perhaps an even more alarming fact to consider about the legal factory is how much money is spent on lawsuits that are never even tried or decided in court. On average, plaintiffs and defendants are spending over 1MM in attorney fees on the estimated 19 out of every 20 cases filed that never get to trial. With this much waste and unfinished business, why would anyone in their right mind continue to rely on traditional litigation to try to solve their disputes? Isn’t there any other more efficient, more effective way to resolve disputes? Didn’t anyone ever suggest trying mediation? Its not easy to find or part with the money often needed settle a lawsuit or dispute. You might think that your toughest negotiations will be with the opposing party. However, there is often an even larger stakeholder in the dispute; someone on your own side; someone who will likely have to be paid first from whatever proceeds are generated upon resolution of the lawsuit; someone who you might have already agreed to pay more to fight this dispute than you could ever reasonably expect to recover in court. If you are not careful, the biggest damage and expense that you will incur as a result of a conflict or dispute will be unrecoverable attorney fees. The American rule of damages provides that each party to a lawsuit is responsible for paying their own attorney’s fees, unless there is a specific statute or contract that allows the assessment of those fees against the other party. In other words, when it comes to litigation, everyone is usually left to pay their own legal bill. In the United States, the average cost (bill) to try a civil lawsuit is between $43,000 and $122,000. The single most time intensive (expensive) parts of litigation are the trial and discovery (taking depositions, etc.). Why does it cost so much? …because everything is a fight. There are faster, less expensive secure ways to cut to the chase and get the bottom of things without relying so heavily on litigation. That’s your elephant, not mine. Its plain to see that resolving disputes can be an expensive proposition, especially if you want a lawyer and the court system to try to resolve your disputes for you. More people need to think twice before racing to court to determine just how much good money to invest on a bad agreement or relationship. Considering the backlog of cases that continue to flood into the court system, a lot of people must be convinced that litigation is still the best place to start. However, sooner or later, almost all of them will learn the hard way that less than 5% of all lawsuits actually get to trial. Most lawsuits are dismissed and left to be settled out of court. Every day frustrated people leave the legal system without a trial, without a resolution and now deeper in debt to their own attorney. If and when these people do finally decide to sit down and try to negotiate a settlement out of court, they will have a tough time trying to persuade the other party to pay more or accept less simply because they chose to spent a lot of money on unrecoverable attorney fees. That’s your elephant not mine. Due process or do more yourself ? I don’t think so many people would sue or choose to remain in a lawsuit so long if they understood that it would cost more to sue than they could legally expect to recover in the end. However, if its too expensive to sue or be sued, does that mean that a lot of people with legal problems to resolve are then effectively left without a legal remedy? No, this is simply a clear indication that litigation is the wrong place to start. The legal system provides many other less expensive (and lesser known) processes to resolve disputes outside the courtroom. Its time more people gave these other legal processes their due first. Mediation is a legal process designed to resolve disputes privately rather than before a judge or jury. Mediation can be completed for a fraction of the time and cost of litigation. On average, more than 75% of disputes that were mediated were resolved at mediation. 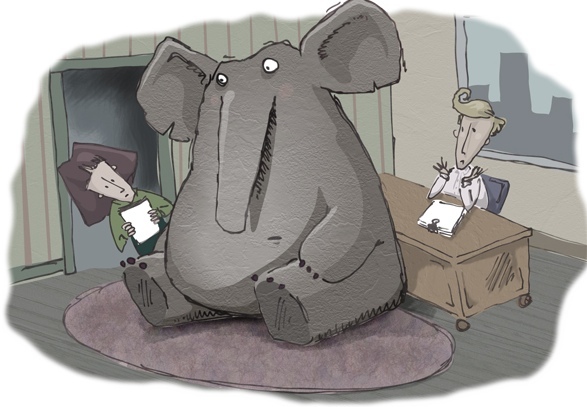 So, when you are sued or you sue someone else, don’t lose sight of the elephants in the room. Take a little more control over your situation and try mediation sooner vs later. It is uncertain what path hurricanes will take, how strong they may become, what areas will be impacted and what damage may result. There are countless forecasts trying to predict exactly what will happen; however, only time will tell. 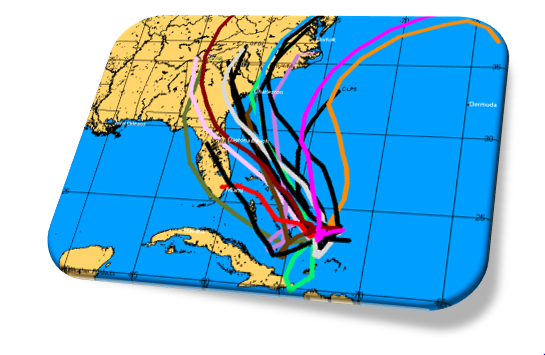 Trying to predict the path of hurricanes is a lot like trying to predict the outcome of a lawsuit. There are always a wide variety of estimates and disagreement over what a court might ultimately decide to award and it is such disagreement that leads people to file and foolishly pursue so many lawsuits in the first place. Plaintiffs overestimate what they think they can get and defendants underestimate their liability and exposure. Only time will tell. Here are a couple of litigation facts and forecasts that you can rely upon with a reasonable degree of certainty; 1) in over 95% of lawsuits, the courts do not decide the case and 2) you should prepare to spend between $40,000 to $122,000 in legal fees and costs to go the distance for that 5% or less chance to get to trial. Unlike hurricanes, you can control the path and outcome of lawsuits and disputes. Unlike hurricanes, you can control the path and outcome of lawsuits. You don’t have to wait and see what a court will do and you don’t have to rely on attorneys to try to extract information from a hostile adversary to determine what path to take. Instead, you can ask the court to gather up all the parties in a room to confidentially discuss and try to work out a settlement under the direction of a trained mediator. Mediators are neutral and are specially trained to look at all sides of a dispute. Mediators can then help to resolve and reconcile all the various opinions and interests. Mediators gather information, separate facts from fiction and help put everyone into a calmer, more informed mindset to make decisions. LEARN MORE. Show your support of less litigation and more private resolution of conflicts and disputes. Up to this point, mediation has remained largely a court-annexed process, meaning that lawyers and judges tend to decide if and when people mediate. We think people should be able to decide for themselves. If you agree, please comment and let us know. Visit our website, subscribe to our blog and follow us on Twitter.